Add Koolada if you wish. 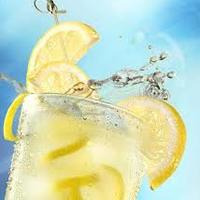 A tart, authentic fresh lemonade, not Country Time or Kool-Aid, but real fresh-squeezed lemonade, light on the sugar. After many months, still one of my favourites. Always in rotation. We need more light on the sugar recipes. Thank you for sharing. This may have been Botboy's idea, but, it was this mixer that put me onto this mix and it is 100%, hands-down my absolute favorite lemonade recipe. Not only have I mixed at least a dozen, but I've tried at least as many commercial lemonade juices, and none of them has ever comes close to this perfection. This tastes like a bold, fresh, real-lemons lemonade mixed with very little sugar and it is exquisite.